Though plastic was invented in the 1800s, it was really only around 1950 that the human-plastic love affair took off. 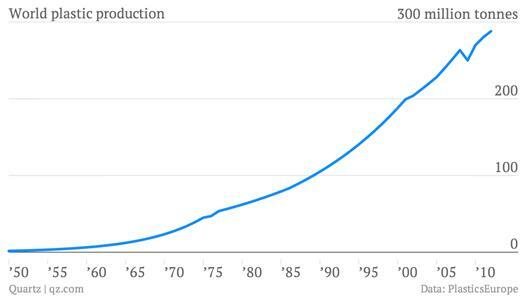 And boy did it—the nearly 2 million tonnes (2.2 million tons) of plastic produced in 1950 had surged twentyfold in just two decades (by around the time a young Dustin Hoffman was advised to consider a future in plastics in The Graduate) (video). Since the 1970s, at least 0.1% of this plastic has ended up in the ocean. Conservative estimates put the amount of plastic bobbing around the ocean at 1 million tons (though it’s probably a lot more). ​Here’s the weird thing: It’s not there. Or at least, most of it isn’t. Scientists have found between 7,000 and 35,000 tons of plastic floating around the surface of the open ocean, according to a just-published study. In other words, 97-99% of that plastic trash has gone missing. So where’d it go? Though it’s possible that sunlight is eroding it into nothingness, or that tiny pieces are washing back ashore, researchers are skeptical.